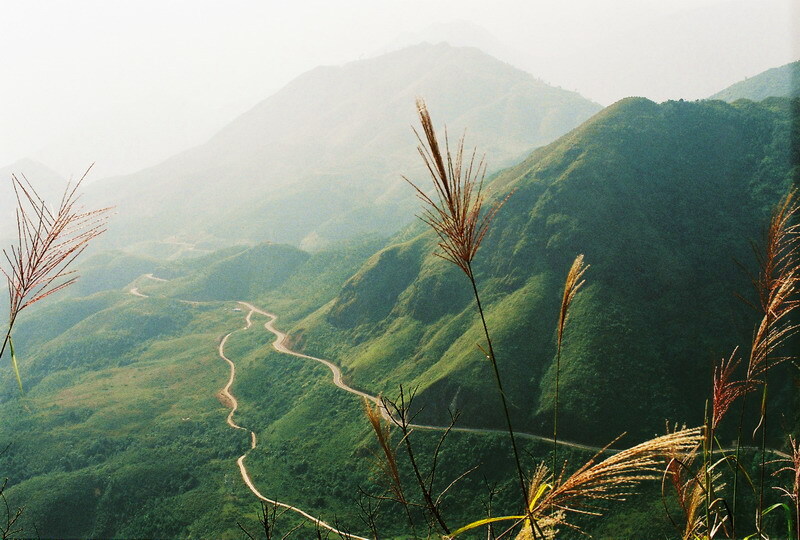 Fansipan is a mountain in Vietnam, the highest in Indochina (comprising Vietnam, Laos, and Cambodia), at 3,143 metres. 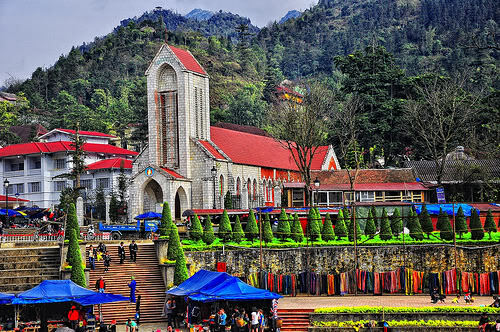 It is located in the Lào Cai Province of the Northwest region of Vietnam, 9 km southwest of Sa Pa Township in the Hoang Lien Son mountain range. 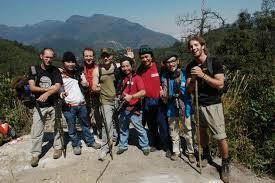 Fansipan is the ideal destination for many people who want to conquer the highest mountain. Night 1: Hanoi – night train to Laocai. 8:30- 9:00 Pm, pick up from your hotel around Hanoi Old Quarter and transfer you to the train station. 10:05 Pm, train departs for SP1 and 9:50 PM for SP3. Day 1: Sapa – 2,800 m of altitude (meals: B,L,D). Pick up from Laocai train station. Transfer to Sapa by minibus. 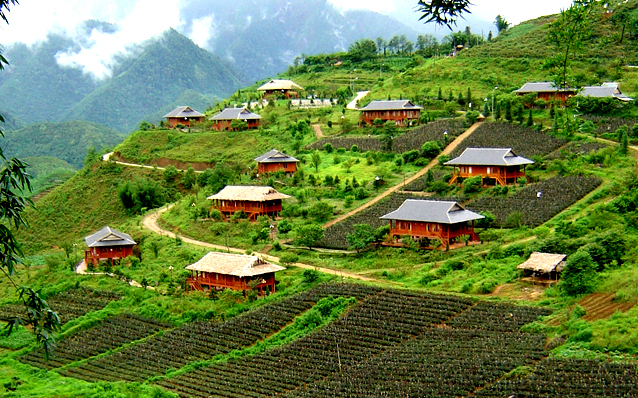 Have breakfast and take a shower before enjoying Sapa tour. Stop for Lunch at a nice sport with great view of the west side area. 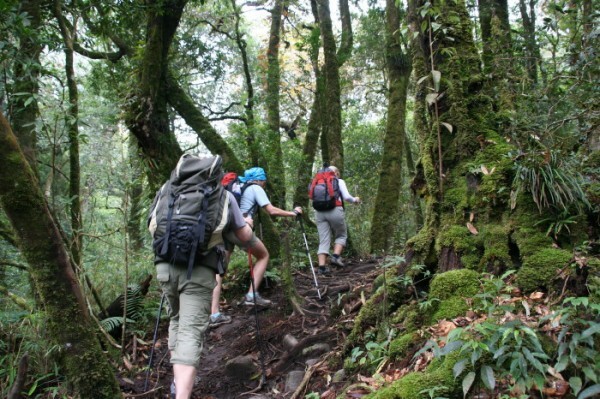 Continue through the thick jungle, the trail gets narrower and steeper. Some part is really slippery and dangerous but the nature get wilder and wilder. We reach to the top of a mountain at 2.800m where our camp will be set for staying overnight. You, guide and porters to seat friendly close to each others to enjoy the tasty moment that all have once in the life of experience. Wake up and Breakfast, we follow a narrow track passing through forest and bamboo bushes, which get smaller and shorter as we approaching to the peak. 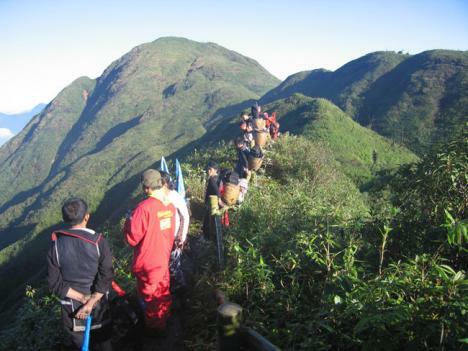 After 2 hours challenging up the steep path, you will reach to the top Fansipan Mount. Congratulation! Staying here to enjoy your success as well as great view of a ever green scenery stretching under your feet. The way back, of course less hard but still dangerous. Arriving back to the 2,800m camp at noon, we have long break for Lunch and recovery and then continue the same way back to Tram Ton pass where our car will pick us up for a transfer back to Sapa at your hotel, you will take a shower and have dinner before transferred by minibus to Laocai train station to take a night train to Hanoi. Day 3: Arrival in Hanoi in the early morning. 8:30 - 9:00 Pm, pick up from your hotel around Hanoi Old Quarter and transfer you to the train station. 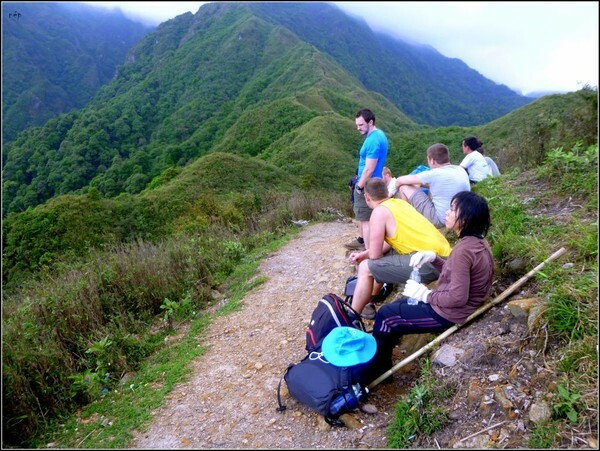 Day 1: Lao Cai station - Sa Pa - an elevation of 2800m with 6-7hrs trek (meals: B,L,D). Arrival in Laocai train station around 6:30 AM, transfer to Sapa for breakfast and shower before enjoying Fansipan climping trip. Take a car transfer 15km via Silver Water Fall to Tram Ton Pass at 1.940m. From here trek through thick tropical jungle. Stop for Lunch at a nice spot with great view of the west side area. 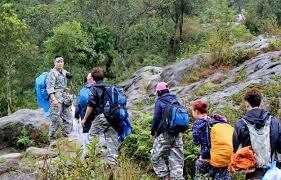 Continue through the thick jungle, the trail gets narrower and steeper. Some part is really slippery and dangerous but the nature get wilder and wilder. We reach to the top of a mountain at 2.800m where our camp will be set for staying overnight.You and your guide, porter put together camping and prepare for dinner. Sitting around the campfire is friendly and adventurous. This may be once in a lifetime experience. Wake up and Breakfast, this day is just for you and tour guide. The porter is required to stay at the camp to look after all your gears. 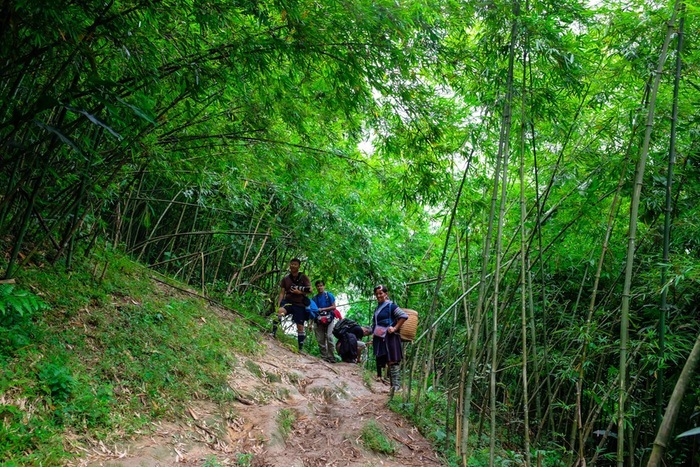 We follow a narrow trail passing through forest and bamboo bushes, which get smaller and shorter as we approaching to the peak. A hard trek heads up to the top, but ropes are unnecessary. 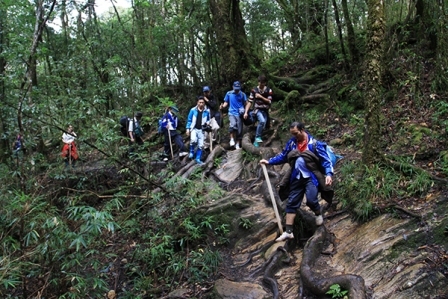 After 2 hours challenging up the steep path, you will reach to the top Fansipan Mount. Congratulation! you will be the vanquisher. Staying here to enjoy your success as well as great view of a ever green scenery stretching under your feet. The way back, of course less hard but still dangerous. Arriving back to the 2.800m camp at noon, we have long break for Lunch and recovery. Most of the trail in the afternoon takes you downhill but very dangerous because many part of the trail is just a narrow track on the steep side of the mountains. Late afternoon, We station at a nice spot on the level of a 2.200m mount, put up our camp, cook our Dinner and stay overnight. Day 3: 5-6hrs on a new trail through Sin Chai Village (meals: B,L,D). Waking up in the freshness and pureness of wild nature, enjoy Breakfast. 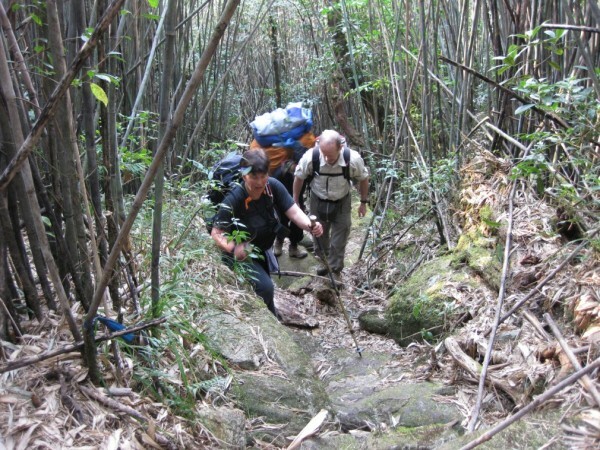 The trail today is less tough and go through a well protected area of the Hoang Lien Son nature reservation, one of the wildest part, rich in plantation and wildlife. 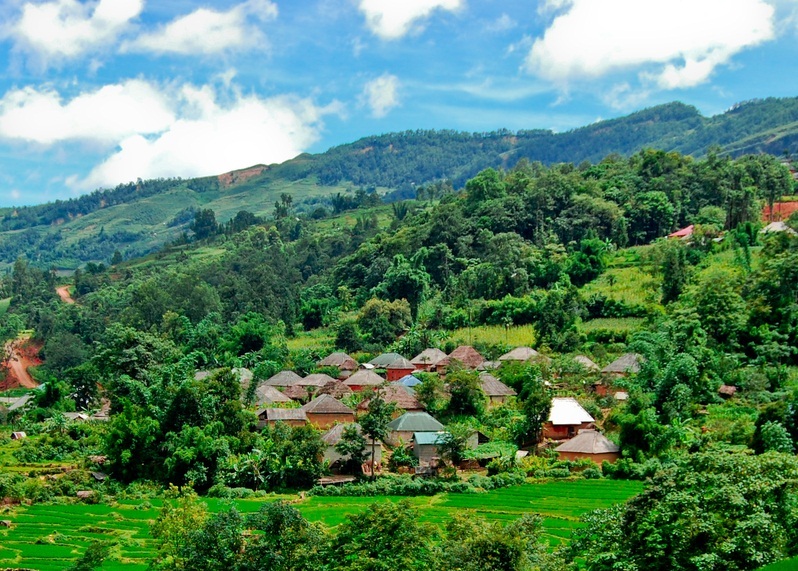 After Lunch at a nice sport, we continue down hill to Sin Chai Village where we spend an hour visiting this pretty Black H’mong village before transferring by car to Sapa. Having shower then have dinner before transferred by minibus to Laocai train station to take a night train to Hanoi. Day 4: Arrival in Hanoi in the early morning around 5:30 AM. You will take a taxi by yourself or requested. Tour finishes. - New generation tourist bus or motorbike, on-and-off pick up as stated in the itinerary. - Meals as stated in the itinerary. - Entrance fees for all tourist sites and environment sanitation. - Experienced tourist guide for all routes. - Luggage porter(s) during your trip. - Sleeping bag and mattress in mountain, daily water. - Luggage room and bath room in hotel. 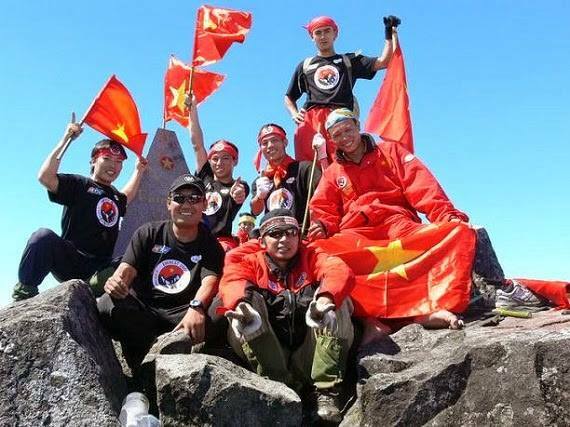 - Certificates for having conquered Fansipan peak. - Personal expenses not stated in the itinerary, drinking, tips for tourist guide, porter and driver. - Raincoat, overcoat, jumper, sleeping suit, shoes for climbing, 02 pairs of socks. - Flashlight, lighter and some nutritious candies.